How should California fund its K-12 school facility needs? With the Brown Administration and the State Legislature returning from the holiday break and looking at options for new K-12 school construction and modernization funding, the word “need” is frequently used…but little understood. They ask, “How do we fund based on ‘need’”? It appears Governor Brown is also interested in this question. His new 2016-17 budget states: “The Administration intends to continue a dialogue with the Legislature to shape a state program that focuses on districts with the greatest needs, while providing substantial new flexibility for districts to raise the necessary resources for their facilities” (emphasis added). The question of how the state will distribute funds according to “needs” will be a key point in the facilities funding debate shaping up for the 2016 legislative session. Enough signatures have been gathered by C.A.S.H. and the CBIA to qualify a $9 billion school construction bond on the November 2016 ballot. Thus, it seems likely that the Governor and the Legislature will propose program alternatives early this year…and a more focused policy debate will follow. To devise a state approach to addressing school facility “needs,” Governor Brown and the Legislature have to understand two key aspects of local needs: local wealth capacity and facility deficiency urgency. In this blog, I describe each and point to strategies other states have used to address them. 1) Local wealth capacity. Assessed Value (AV) reflects property taxbase wealth, which determines a school district’s ability to raise capital dollars for facilities through property taxes (Capital dollars are generally used for major construction and renovation projects, not routine maintenance and repair. Districts typically use local general obligation bonds to raise these funds.) The taxable property may belong to families with children enrolled in the school district, by residents without children in the schools, or by commercial and industrial owners. Districts in California have unequal assessed values. 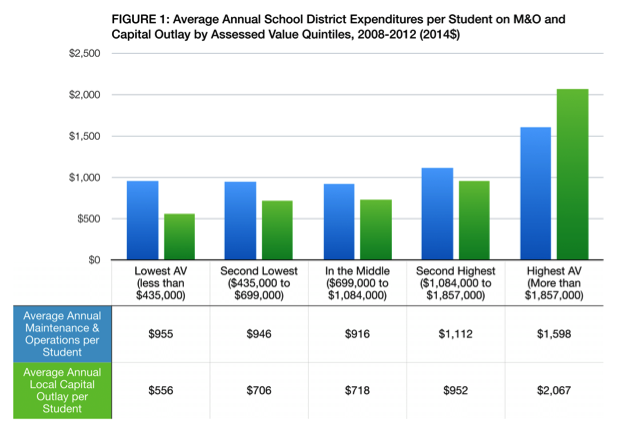 As we found in the Going it Alone study, the school districts with the highest AV outspent all others on facilities— nearly 4 times more per student on capital outlay and 1.5 times more on M&O than districts with the lowest AV, as shown in Fig. 1. How do other states address varying local wealth? Of the 39 states that provide capital dollars to local school districts, 23 of them adjust the amount based on some measure(s) of local wealth. These states give more funding to districts with low taxable wealth (and in some cases also to districts with more low income students). For example, New York’s school facility funding formula varies from 0% in the districts with the highest property values to 90% in the districts with the lowest property values. Massachusetts’ formula adjusts for relative wealth (using indicators of community income, local property values, and free/reduced lunch enrollment). Colorado’s formula uses seven factors of local capacity and past local investment effort to determine state funding amount. 2) Urgency of specific facility deficiencies at schools. Deciding the urgency of one project over another is far less cut and dry than determining local wealth. For example, a district may have severely overcrowded schools as a result of fast (or unanticipated) growth. This district urgently needs to add more capacity to reduce crowding. Another example would be a school with a leaking roof that threatens to cause many additional, and more expensive, problems if it is not repaired or replaced. Or consider a school that is deemed seismically unsound. All of these are “urgent.” The question facing state policymakers in the context of limited school facilities funds: How do we assess the relative urgency of these projects? Which ones should get funded first? How do other states address urgency? Colorado clearly addresses urgency in legislation, prioritizing health and safety issues by providing funds to rebuild, repair, or replace the state’s most dangerous and most needy facilities first. In Washington State, the State Superintendent of Public Instruction ranks and prioritizes submitted projects for funding under new construction and modernization categories. Unlike in California, these states have multiple funding cycles per year, whereby projects are prioritized based on urgency within that cycle. California should consider this approach rather than its current first-come, first served revolving door application procedure. As Governor Brown and the California State Legislature draw up their school construction and modernization funding proposal, they should incorporate these two measures of need into the allocation formula. To devise a financial approach that effectively leverages both state and local dollars, state lawmakers should factor in local wealth capacity. But state lawmakers also must understand the sheer magnitude of facility deficiency across the state. To ensure all students and teachers have adequate facilities, we need a system that targets overall needs. If we grossly undercut that, we will be compounding problems. Fairly allocating a nickel towards a whole dollar’s worth of needs digs us into a deeper hole – and undermines school quality. While the state’s share may vary across school districts based on their ability to pay, at the end of the day Governor Brown and the Legislature will have to figure out a system that generates more than $1 billion per year of combined state and local capital investment in existing K-12 school facilities. Truly addressing California’s school facility needs will involve a variety of policy reforms — and perhaps a little creativity about creating a regular revenue stream —to provide all students safe, healthy and functional facilities. Jeff Vincent, PhD, is deputy director of the Center for Cities + Schools in the Institute of Urban and Regional Development at UC Berkeley. All views here are his own. California’s funding formula is unconstitutional. Further- to be clear, the State’s 5 year Infrastructure plan does not allocate one penny to K-12 public education. The State of California uses its public education system to redistribute wealth not educate students. Shameful is the operative word to properly describe California’s public school funding! California has a GDP of approximately $2.4 trillion, yet spends a meager $1 billion per year for capital investment in K-12 public schools….. approximately 0.04% of its GDP. How disgusting is this? This is extremely disgusting and shameful. And already the forces are at work to keep all K-12 funding at shamefully low levels by upstaging the critical needs in public education with partisan bickering between the wealthy and the poor, as alluded to in this blog. This will ensure that class warfare (anger and chaos) will dominate instead of constructive planning and programming. Oh, and by the way, did anyone notice the news yesterday about the $150 million deficit at Berkeley?